Creating the marketing message on your book cover--your book's front and back cover copywriting--should be a once-and-done function. You are not just creating "blurbs," you are choosing how to identify and communicate adn attrace people to your brand. Take a look at the book brand we developed for Brenda Bence, a world-reknown corporate branding expert (it just shows that even a branding expert needs some help from the outside). 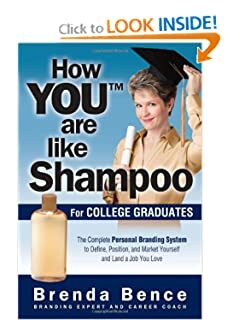 We created Brenda's three "How YOU™ Are Like Shampoo" book titles as a series for her. These book titles and more enable Brenda to continually expand her now well branded expertise to other niche markets through books that are adding value to her consulting practice. With more than 25 years experience within Fortune 100 multinational corporations--from Procter & Gamble and Bristol-Myers Squibb to Mattel and Pizza Hut--Brenda Bence has been responsible for marketing some of the world's biggest-selling consumer brands in nearly 50 countries across four continents. Also a certified career coach, Brenda Bence has now married her passion for corporate branding and her passion for coaching to create a personal branding system. This system is based on the same methods she has developed and used to help her corporate clients grow powerhouse name brands. 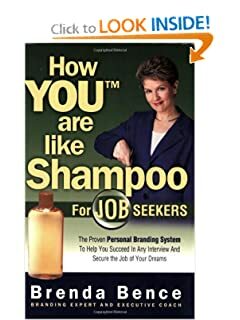 In e ach book of her "How YOU™ Are Like Shampoo" series, Brenda translates these methods into ready-to-use techniques for professionals, job seekers, and even college grads. The result is a series of step-by-step guides she now uses to attract a whole host of new markets and potential new clients to her expertise. "This groundbreaking book provides you with a start-to-finish system for defining, communicating, and taking control of your personal brand at work. 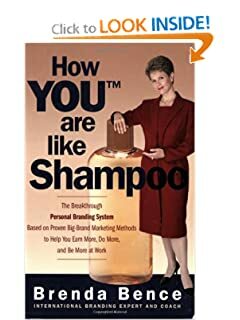 Modeled after the world’s most successful big-brand marketing methods, How YOU™ Are Like Shampoo guides you step-by-step through proven corporate branding techniques never before adapted for personal use." name-capture device on her website when visitors get there. Each of these book cover components is part of Brenda's now "once-and-done" brand marketing strategy. It gives her a brand on which she (and we) continue to build. If, like Brenda, you'd like to transition your expertise into new areas, give us a call. It may be that you are just getting started or looking for a fresh start. Either way, getting your marketing message and positioning right early on helps you make the leap smoothly and successfully so that you, too, grow a powerful and profitable presense that just keeps growing. Email us at info@writetoyourmarket.com or call 715-634-4120.